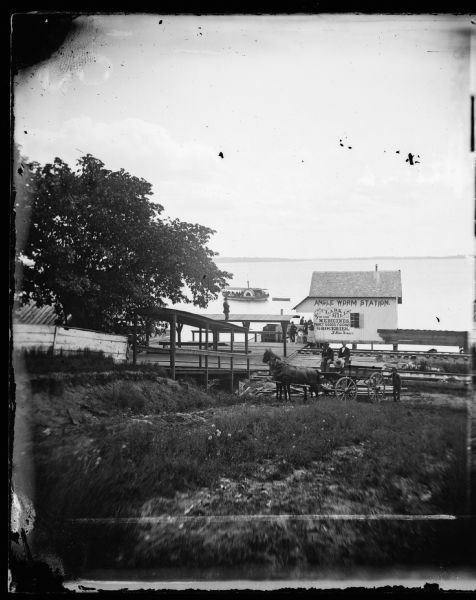 View from the foot of Carroll Street with the Angle Worm Station at Barnes boat landing on Lake Monona. Shows the Scutt II taken from the first successful steamboat, Scutanawbequon, launched July 21, 1864. Advertisement for Clark and Miller's general store featuring medicines, fancy goods and groceries. The Angleworm Station was named for an oration Captain Frank Barnes gave each Fourth of July celebration on how civilization was dependent on the earthworm. The steamboat name, Scutanawbequon, translates as "fire canoe."